This largely depends on a reduction in calorie intake. The commonest diets allow an intake of approximately 1000 kcal (4200 kJ) per day, although this may need to be nearer 1500 kcal (6300 kJ) per day for someone engaged in physical work. A diet that is too low in totalcalories will usually result in the patient cheating and keeping to the diet only for short periods. Patients must realize that prolonged dieting is necessary for large amounts of fat to be lost. Furthermore, a permanentchange in eating habits is required to maintain the new low weight. It is relatively easy for most patients to lose the first few kilograms, but long-term success in moderate obesity is poor, with an overall success rate of no more than 10-20%. The aim of any dietary regimen is to lose approximately I kg per week. Weight loss will be greater initially owing to accompanying protein and glycogen breakdown and consequent water loss. After 3-4 weeks, weight loss may be very small as only adipose tissue is broken down and there is no accompanying water loss. Patients must understand the principles of energy intake and expenditure and the best results are obtainedin educated, well-motivated patients. 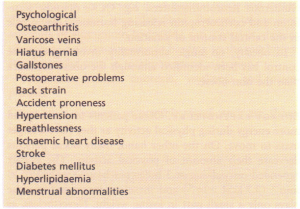 Constant supervision, either by a doctor, close relatives or through slimming societies (e.g. WeightWatchers) helps to encourage compliance. An increase in exercise will increase energy expenditure and should be encouraged, as long as there is no contraindication such as cardiovascular disease. Weight cannot be lost by exercise alone, as even a 15-min brisk daily walk will use less energy than is contained in a small slice of bread and butter. The diet should contain adequate amounts of each nutrient; a diet of 1000 kcal (4200 kJ) per day should be made up of approximately 100 g of carbohydrate, 50 g of protein and 40 g of fat. The carbohydrate should be in the form of complex carbohydrates such as vegetables and fruit rather than simple sugars. 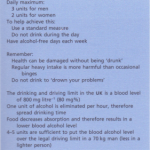 Alcohol contains 7 kcal g-l and should be discouraged. It can be substituted for other foods in the diet, but it often reduces the willpower. With a varied diet, vitamins and minerals will be adequate and supplements are not necessary. A balanced diet, attractively presented, is of much greater value and safer than any of the slimming regimens often advertised in women’s magazines. Most obese people oscillate in weight; they often regain the lost weight, but many manage to lose weight again. This ‘cycling’ in body weight may playa role in the development of coronary artery disease. Drugs can be used as an adjunct to the dietary regimen but they do not substitute for strict dieting. Amphetamine is addictive, although some less-stimulating derivativesare now available that produce anorexia. However, their use should be discouraged as they cause dependency and psychotic states. 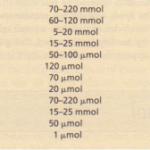 The most commonly used drugs are diethylproprion (75 mg daily) and fenfluramine. The latter differs in that it acts on the serotoninergic system rather than the catecholaminergic pathway, which is affected by the amphetamine derivatives. It can be given in doses up to 100 mg daily, but side-effects are frequent.frequent. None of the drugs should be given long-term; they should be withdrawn slowly. WIRING THE JAWS to prevent eating and allow liquid feeds only. This can be used as a temporary measure but good dental hygiene is essential. Weight gain usually occurs after the wires have been removed, but this can be controlled by the use of a tight waist cord. GASTRIC PLICATION, in which a small gastric pouch is created by stapling across the wall of the stomach. Good results are claimed without the side-effects of bypass operations. GASTRIC BALLOON. Here a balloon is placed endoscopically inside the stomach and inflated. 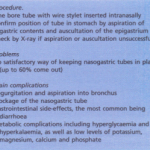 Its value has been over-exaggerated and complications include intestinal obstruction. There is an increase in death in obese patients, mainly from diabetes, coronary heart disease and cerebrovascular disease. The greater the obesity the higher the morbidity and mortality figures. For example, men who are 10%overweight have a l3% increased risk of death, whilst the increase in mortality for those 20% overweight is 25%. The rise is less in women. Weight reduction reduces this mortality and therefore should be strongly encouraged.